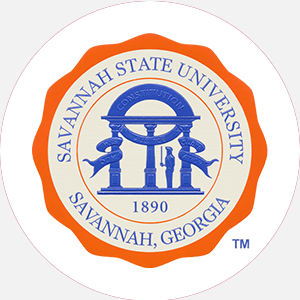 Savannah State University is a four-year, state-supported, coed college founded in 1890 as Georgia S…. Savannah State University is a four-year, state-supported, coed college founded in 1890 as Georgia State Industrial College for Colored Youth. The school awarded its first baccalaureate degree in 1898, but did not become a four-year college until after 1926. The first women students were admitted as boarders in 1921. The school was officially named Savannah State College in January of 1950. Savannah was established under the 1890 Land Grant Act that required states to provide educational training for black youth. Savannah State served as the state of Georgia’s land-grant institution for blacks until 1947. Savannah State’s historical mission to train black students has broadened to embrace all individuals regardless of race, ethnicity, culture, or age. The College is committed to making higher education accessible and excellent. Due to mandated desegregation in 1979, a program exchange occurred between Savannah State’s faculty members and students in the Division of Education and Armstrong State College’s faculty members and students in the Division of Business. This exchange resulted in the creation of a new School of Business at Savannah. The campus is made up of forty buildings located on 165 beautifully landscaped acres that have an architectural blend of the old and the new. The campus is uniquely located within two city limits, Savannah and Thunderbolt. Savannah State University is accredited by the Southern Association of Colleges and Schools to award associate, Bachelor of Arts, Bachelor of Science, and master’s degrees. Percentage of students receiving financial aid: 85 Financial Aid Specific to the School Approximately thirty endowed or alumni scholarships are available to students. These include athletic awards, academic interest/achievement awards, special achievement/activities awards, and special characteristic awards. Continuous notification; August 1 (priority), September 1 (fall). A high school diploma (or equivalent) with 15 college prep units, including the following: 4 English, 3 science, 3 mathematics, 3 social science, and 2 foreign language. Students must submit certificates of immunization for measles, mumps, and rubella unless exempt for physical or religious reasons. A nonrefundable application fee is due with application. Admission Application Deadline: Rolling admissions; May 1 (fall priority) December 15 (spring priority) Admission Contact: Director of Admissions and Records, Savannah State University, Hodge Hall, PO Box 20209, Savannah, Georgia 31404; Telephone: 912-356-2181; Toll-free: 800-788-0478; Fax: 921-356-2256. A minimum of 120 hours, including completion of the core curriculum to include humanities, the sciences, and social sciences; a cumulative GPA of 2.0; completion of PSC 200 or HIS 202 or 203; passing score on the University of Georgia Language Skills Examination; at least one year of residence at Savannah State to include senior year. Campus Regulations: Students must live on campus unless they are commuters who live at home. Campus Services: Health center, personal and psychological counseling, and career counseling and placement services. The college testing program serves as a national testing center for the GMAT, LSAT, GRE, SAT, NTE, CLEP, and MAT. Campus Activities: Many activities for cultural enrichment complement formal education on campus. Assemblies, motion pictures, lectures, art exhibits, and drama are some of the activities provided. Students interested in music can become members of the concert choir, band, or Wesleyan gospel choir. Students can take part in the publication of the student newspaper, Tiger Boar, or the college yearbook, The Tiger. The College radio station (WHCJ-FM) serves as a training unit for the Mass Communications program and accepts student volunteers. Leadership opportunities can be sought in the more than seventy-five student organizations representing athletics, service clubs, honors, media publications, and interest groups, as well as the Student Government Association (SGA). Greek fraternities include Alpha Phi Alpha, Omega Psi Phi, and Phi Beta Sigma; sororities include Alpha Kappa Alpha, Delta Sigma Theta, Sigma Gamma Rho, and Zeta Phi Beta. Local sororities include Delta Sigma Pi. Honor societies include Alpha Kappa Mu, Beta Beta Beta, Beta Kappa Chi, Kappa Delta Pi, Phi Beta Lambda, Phi Mu Delta, Pi Gamma Mu, Sigma Delta Chi, Sigma Tau Delta, Tau Alpha Pi, and the Biomedical Society. Housing Availability: 1,020 housing spaces. Handicapped Services: Students who have visual, auditory, or motor handicaps may arrange for local certification of competency with regents.